An American soldier dies fighting ISIS, but we won't call it "combat." 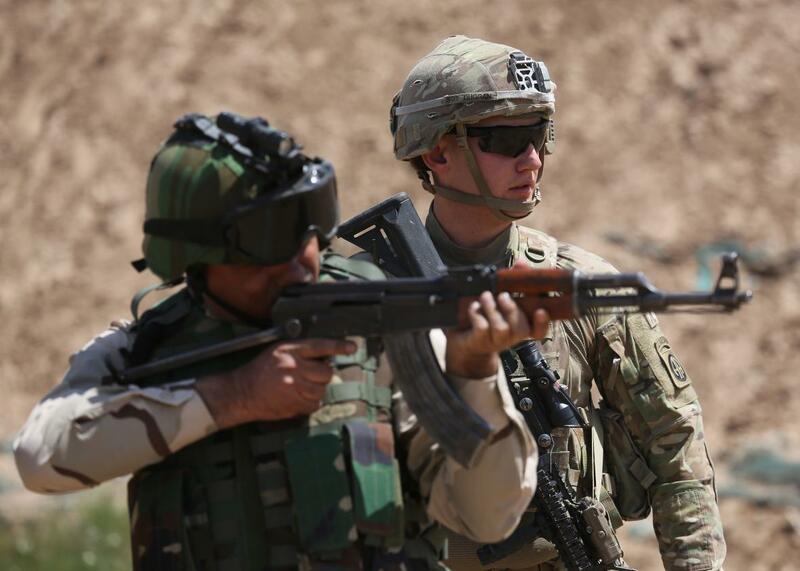 A U.S. Army trainer watches as an Iraqi recruit fires at a military base on April 12, 2015, in Taji, Iraq. Based on the events of the past week, U.S. troops on foreign ground fighting against a foreign enemy and a U.S. service member being killed in the course of battle still does not constitute “combat” to this White House. More details are now emerging about the rescue operation on Thursday in which U.S. and Kurdish forces freed 70 prisoners held by ISIS in Iraq. One American, now identified as 39-year-old Master Sgt. Joshua L. Wheeler, died in the operation, becoming the first American killed in action in Iraq since the operation against ISIS was launched there last year. It was also the first time that U.S. ground troops had accompanied local forces in an operation against ISIS in Iraq. These troops have previously been confined to bases where they are working to train and advise Iraqi and Kurdish forces in the fight against ISIS. The operation was launched at the request of Kurdish officials, who said they had solid intelligence that a large number of Kurdish prisoners, including peshmerga fighters who have been highly effective in the fight against ISIS, were about to be executed. This isn’t the first time that U.S. special operations troops have put “boots on the ground” to fight ISIS. Other examples have included the raid that killed ISIS commander Abu Sayyaf in Syria in May, as well as a failed operation last summer to rescue American journalist James Foley and other hostages. To the degree that there is a legal basis for the operation against ISIS, these raids fall under it. The proposed authorization for the use of military force against ISIS, which was never approved by Congress but can be still be read as the administration’s self-imposed legal framework for the operation, rules out “enduring offensive ground combat operations,” language that seems tailored to allow for just this kind of situation. It’s also still true that we still aren’t seeing anything close to the level of combat operations that U.S. forces were engaged in prior to the 2011 withdrawal. But it certainly feels like a stretch to say that an American soldier ordered into a battle in which he was killed wasn’t involved in an “active combat mission.” The question of what constitutes “combat” is particularly salient as the U.S. continues to extend its troop presence in Afghanistan long after the declared end of combat operations there. This is a war that has hardly been immune to mission creep, and if progress against ISIS continues to stall, there will be more opportunities for raids of this kind, and it’s worth asking at what point we’re willing to admit that American troops are involved in combat against the group, rather than whatever this is.